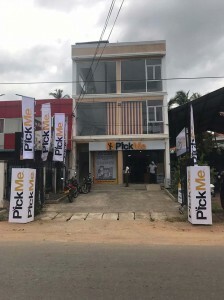 Sri Lanka’s leading taxi-hailing app PickMe officially launched its brand in the city of Kurunegala on 3rd July. The launch ceremony was graced by PickMe Chief Executive Officer Jiffry Zulfer, Chief Operating Officer Isira Perera, board members and PickMe employees. The new PickMe office is located at 206/A, Wilgoda Road , Kurunegala. “Moving forward, as Sri Lanka’s revolutionary mobility solutions provider, we are looking forward to provide a safe, secure and dependable transportation system to the whole country and nurture the growing driver entrepreneur community through PickMe.” Zulfer further stated. As the Company reaches its milestone 3rd year of success, PickMe offers passengers a choice of vehicles to book ranging from Tuk Tuks, cars and minivans to VIP vehicles. Today, PickMe drivers enjoy the security of a reliable occupation that has elevated their social positioning. Currently, the PickMe platform caters to over 15,000 drivers and offers professional services to over 1.5 million passengers spread across four districts in the country. PickMe is a software solution that enables instant taxi hailing via a platform that hosts the largest organized taxi fleet in Sri Lanka, with over fifteen thousand three-wheelers, mini cars, cars, vans and luxury sedans, PickMe currently services the transportation needs of over one million passengers based in Colombo, Gampaha, Kalutara and Kandy districts. Adding to its portfolio of services, PickMe also provides corporate traveling solutions to businesses and organizations with the PickMe Business Portal, the benefits of which is currently enjoyed by over 150 corporates in the country.